A new heat source detected near the south pole of Jupiter’s moon Io may be the site of a previously undiscovered volcano, according to researchers working with data returned by NASA’s Juno spacecraft. 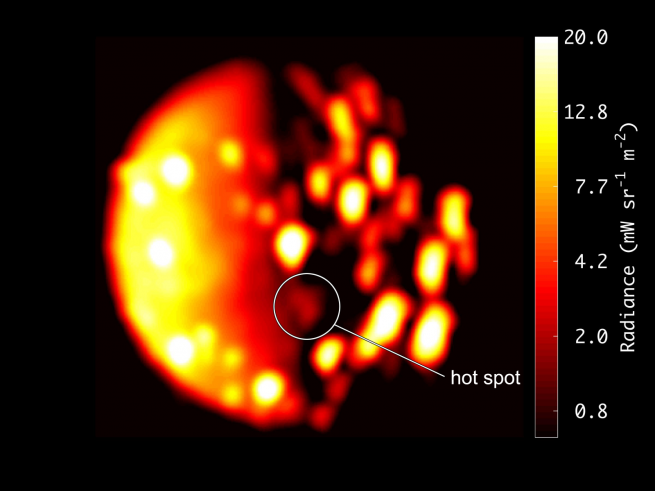 Images captured by Juno’s Jovian InfraRed Auroral Mapper (JIRAM) instrument in the infrared reveal a hot spot detected Dec. 16, 2017, when the probe came within 290,000 miles (470,000 kilometers) of the innermost Galilean moon. In infrared images, brighter colors indicate higher temperatures. Io is the smallest of Jupiter’s four Galilean moons, which were discovered by Galileo Galilei in 1610. It has a diameter of 2,264 miles (3,640 kilometers) and is the Solar Systems’ most volcanically active world. There are 150 known active volcanoes that spew lava up to 250 miles (400 kilometers) high into space. The moon’s volcanoes were discovered during previous missions to Jupiter including Voyagers 1 and 2, Galileo, Cassini, and New Horizons. Scientists suspect Io has approximately 250 more still-undiscovered volcanoes. Churning activity within the moon’s interior is driven by the powerful gravitational pull of Jupiter and by the gravitational influences of the gas giant’s other three Galilean moons: Europa, Ganymede and Callisto. Juno has traveled almost 146 million miles (235 million kilometers) since entering orbit around Jupiter on July 4, 2016. Circling Jupiter in an elliptical orbit, it has a science mission that takes it close to the planet every 53 days. During these close flybys, the probe studies the giant planet’s cloud tops and peers beneath them to image its auroras in an effort to learn more about Jupiter’s origins, structure, mangetosphere, and atmosphere, according to NASA. Since orbit insertion, Juno has flown as close as 2,100 miles (3,400 kilometers ) above the giant planet’s cloud tops. The spacecraft’s 13th close flyby occurred on July 16, 2018. Future flybys are expected to come even closer to both the cloud tops and to Io. Juno scientists are currently analyzing JIRAM data collected last December and will integrate it with information that will be gathered in upcoming flybys through the mission’s end in July 2021.